The Action Group for Better Architecture in New York (AGBANY) was formed to advance the public purposes of architecture and planning. AGBANY’s aims included preservation and advocacy. Its first and primary cause was the preservation of McKim, Mead & White’s Pennsylvania Station. In August 1964, McKim, Mead and White’s 1927 Savoy-Plaza Hotel was going to be demolished and replaced by a 48-story corporate headquarters for General Motors.15 In protest against the demolition, AGBANY’s Elliot Willensky led a "funeral march." Placards featured pointed slogans such as "Landmarks Preservation Weak.”16 This campaign also proved unsuccessful and the Savoy-Plaza Hotel was demolished in 1965. Jeffrey Ellis Aronin to Norval White, 9 August 1962, Anthony C. Wood Archive. Christopher Gray, “A 1960’s Protest that Tried to Save A Piece of the Past,” The New York Times, 20 May 2001. Resolutions for Unincorporated Club, Society or Association, Irving Trust Company, Action Group for Better Architecture, 23 July 1962, Anthony C. Wood Archive. Anthony C. Wood, Preserving New York: Winning the Right to Protect A City’s Landmarks (New York: Routledge, 2008), page 297. Gregory F. Gilmartin, Shaping the City: New York and the Municipal Art Society (New York: Clarkson Potter, 1994), page 370. Eric J. Plosky, “The Fall and Rise of Pennsylvania Station; Changing Attitudes Toward Historic Preservation in New York City,” Unpublished dissertation. Massachusetts Institute of Technology, February 2000. “Save Our City,” The New York Times, 2 August 1962. 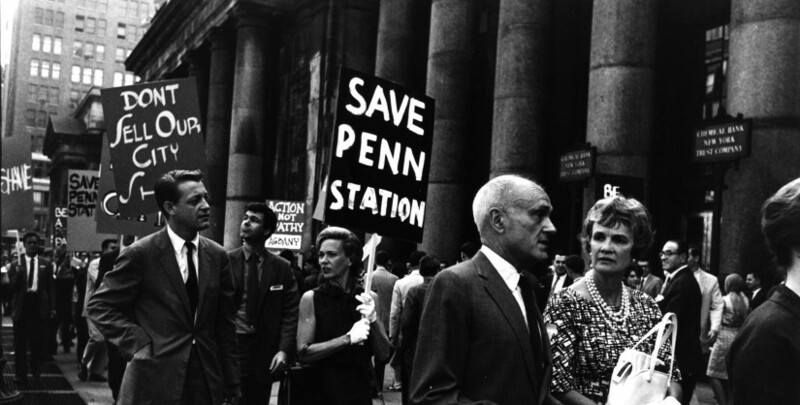 Foster Hailey, “Architects Fight Penn Station Plan,” The New York Times, 3 August 1962. Resolution 300, The Committee on City Affairs, 21 August 1962. Robert F. Wagner Papers, New York City Municipal Archive. “Asks Museum in Penn Station,” World Telegram, 2 August 1962. “Wagner Confers on Penn Station,” The New York Times, 11 September 1962. Glenn Fowler, “48-Story Tower to Rise on Savoy Plaza Site,” The New York Times, 16 December 1964. Thomas Ennis, “Coming Demise of Savoy Plaza Mourned by Student Marchers,” The New York Times, 3 October 1964.